Includes the Hugo-winning The Girl-Thing Who Went Out for Sushi by Pat Cadigan. 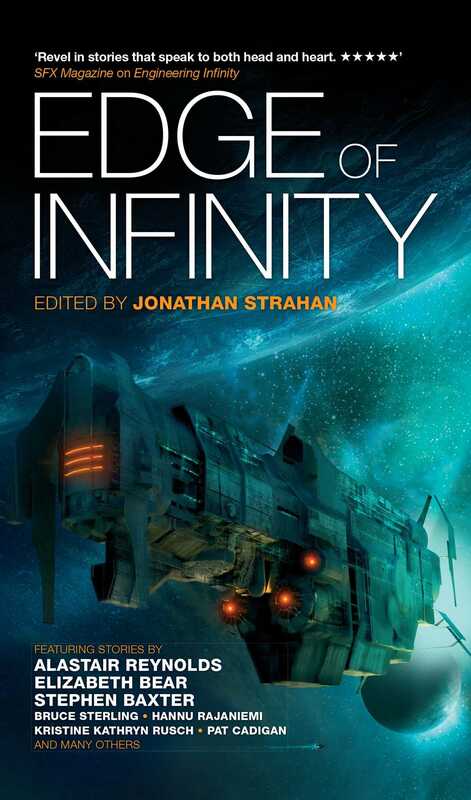 This collection follows "the year's single best SF anthology" (Gardner Dozois in Locus, Engineering Infinity, the first SF anthology from multiple award-winning editor Jonathan Strahan for Solaris.Edge of Infinity is an exhilarating new hard SF anthology that looks at the next giant leap for humankind: the leap from our home world out into the Solar System. "One giant leap for mankind". Those were Neil Armstrong’s immortal words when he became the first human being to step onto another world. All at once, the horizon expanded; the human race was no longer Earthbound. Our destiny would now be to reach out to eternity. Brought to you by the creators of Engineering Infinity, Edge of Infinity is an exhilarating new SF anthology that looks at the next giant leap for humankind: the leap from our home world out into the Solar System. From the eerie transformations in Pat Cadigan’s “The Girl-Thing Who Went Out for Sushi” to the frontier spirit of Sandra McDonald and Stephen D. Covey’s “The Road to NPS,” and from the grandiose vision of Alastair Reynolds’ “Vainglory” to the workaday familiarity of Kristine Kathryn Rusch’s “Safety Tests,” the thirteen stories in this anthology span the whole of the human condition in their race to colonise Earth’s nearest neighbours. Featuring stories by Hannu Rajaniemi, Alastair Reynolds, James S. A. Corey, John Barnes, Stephen Baxter, Kristine Kathryn Rusch, Elizabeth Bear, Pat Cadigan, Gwyneth Jones, Paul McAuley, Sandra McDonald, Stephen D. Covey, An Owomoyela, and Bruce Sterling, Edge of Infinity is hard SF adventure at its best and most exhilarating.